This article is about the city in England. For other uses, see Chelmsford (disambiguation). 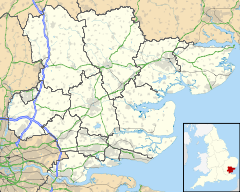 Chelmsford (/ˈtʃɛlmzfərd/) is the principal settlement of the City of Chelmsford district, and the county town of Essex, in the East of England. It is located in the London commuter belt, approximately 30 miles (48 km) northeast of the notional centre of London at Charing Cross and approximately 22 miles (35 km) from Colchester. The urban area of the city has a population of approximately 112,000, whilst the district has a population of 168,310. The main conurbation of Chelmsford incorporates all or part of the former parishes of Broomfield, Great Baddow, Galleywood, Writtle, Moulsham, Widford, and Springfield, including Springfield Barnes, now known as Chelmer Village. Chelmsford's population consists of a large number of City and Docklands commuters, attracted by the 30–35 minute journey into Central London via the Great Eastern Main Line railway. The same journey takes approximately 60 minutes by road via the A12. On 14 March 2012, Lord President of the Privy Council and Deputy Prime Minister Nick Clegg announced that Chelmsford along with Perth, Scotland and St Asaph, Wales was to be granted city status to mark the Diamond Jubilee of Elizabeth II. The Letters Patent officially granting city status to Chelmsford were received on 6 June 2012. The 18-arch Victorian Railway Viaduct that carries the Great Eastern Main Line through Central Park. Before 1199, there were settlements nearby from ancient times. A Neolithic and a late Bronze Age settlement have been found in the Springfield suburb, and the town was occupied by the Romans. A Roman fort was built in AD 60, and a civilian town grew up around it. The town was given the name of Caesaromagus (the market place of Caesar), although the reason for it being given the great honour of bearing the Imperial prefix is now unclear – possibly as a failed 'planned town' provincial capital to replace Londinium or Camulodunum. The remains of a mansio, a combination post office, civic centre and hotel, lie beneath the streets of modern Moulsham, and the ruins of an octagonal temple are located beneath the Odeon roundabout. The town disappeared for a while after the Romans left Britain. In 1199, following the commissioning of a bridge over the River Can by Maurice, Bishop of London, William of Sainte-Mère-Eglise was granted a Royal Charter for Chelmsford to hold a market, marking the origin of the modern town. An under-cover market, operating Tuesday to Saturday, is still an important part of the city centre over 800 years later. The city's name is derived from Ceolmaer's ford which was close to the site of the present High Street stone bridge. In the Domesday Book of 1086, the town was called Celmeresfort and by 1189 it had changed to Chelmsford. Its position on the Londinium – Camulodonum Roman road (the modern A12) ensured the early prosperity of Chelmsford. An Anglo-Saxon burial was discovered at Broomfield to the north of Chelmsford in the late 19th century and the finds are now in the British Museum. The road 'Saxon Way' now marks the site. In the 17th century many of the victims of Matthew Hopkins (the self-styled "Witchfinder General") spent their last days imprisoned in Chelmsford, before being tried at the Assizes and hanged for witchcraft. Henry VIII purchased the Boleyn estate in 1516, and built Beaulieu Palace on the current site of New Hall School. This later became the residence of his then mistress, and later wife Anne. Soon after it became the residence of Henry's daughter, by his first marriage, Mary I. King Robert I of Scotland, better known as Robert the Bruce, had close ties with the nearby village of Writtle and there is some evidence to suggest he was born at Montpeliers Farm in the village, but the story is disputed and possibly conflated with his father, Robert de Brus, 6th Lord of Annandale. During World War II Chelmsford, an important centre of light engineering war production, was attacked from the air on several occasions, both by aircraft of the Luftwaffe and by missile. The worst single loss of life took place on Tuesday 19 December 1944, when the 367th Vergeltungswaffe 2 or V2 rocket to hit England fell on a residential street (Henry Road) near the Hoffmans ball bearing factory and not far from the Marconi Wireless Telegraph Company factory in New Street which may also have been the target. (Hoffmans ball bearing factory was key to the war effort, supplying bearings for countless applications. This obviously made it a key target) Thirty-nine people were killed and 138 injured, 47 seriously. Several dwellings in Henry Road were completely destroyed, and many in nearby streets were badly damaged. A recently restored monument to the dead is in the city cemetery in Writtle Road. On 13 May 1943 Luftwaffe bombing raids hit Chelmsford leaving more than 50 people dead and making nearly 1,000 residents homeless. The bombs on this night were dropped mainly in the town centre, Springfield and Moulsham. The GHQ Line part of the British hardened field defences of World War II runs directly through Chelmsford with many pillboxes still in existence to the north and south of the city. Hylands Park, the site of the former annual V festival, and its replacement the RiZe festival, then hosted a prisoner of war camp, and from 1944 was the headquarters of the Special Air Service (SAS). Since the 1980s Chelmsford has suffered from a decline in its defence-related industries, most notably the Marconi Company with all of its factories either being closed or sold. The site on West Hanningfield Road was sold to BAE; the Waterhouse Lane site sold to E2V and the New Street site is undergoing major redevelopment for residential/mixed use.. However, the city's location close to London and at the centre of Essex has helped it grow in importance as an administrative and distribution centre. The one-time largest employer in Chelmsford, RHP, the former Hoffman ball bearing manufacturing company, closed its New Street/Rectory Lane site in 1989. Some of the factory remains and has been converted into luxury apartments and a health club although most of the site was demolished to make way for the Rivermead Campus of the Anglia Ruskin University. Beaulieu Park, The Village and Chancellor Park are some of the most recent large-scale housing developments built in the city to complement earlier developments, such as Chelmer Village which was built in the 1980s. In 2007, the Channel 4 programme "Location, Location, Location" voted Chelmsford the 8th-best place to live in the UK. Chelmsford is at the geographic and political centre of Essex and has been the county town since 1215. It is the location of the headquarters of Essex County Council at County Hall on Duke Street and the headquarters of Chelmsford City Council on Duke Street. The headquarters of Essex Police is located in the Springfield area of the city at Kingston Crescent. Chelmsford formed part of the ancient Chelmsford hundred of Essex. It was incorporated as a municipal borough in 1888, under the provisions of the Municipal Corporations Act 1882. In 1934 the borough was enlarged by gaining 1,659 acres (6.71 km2) from Chelmsford Rural District, including parts of the parishes of Broomfield, Springfield, Widford and Writtle. The municipal borough was abolished in 1974 and its former area was combined with most of the remainder of the rural district to form the larger Borough of Chelmsford. For the Chelmsford constituency in the House of Commons the member of Parliament is Vicky Ford. In the 2017 general election, Ford gained 30,525 votes (53.7%), winning the seat with a majority over Chris Vince, the Labour candidate, who gained 16,953 (29.8%). In the 2001 Census, the population for Chelmsford consisted of male: 49.2%, female: 50.8%, under 18: 22.5%, over 60: 19%, born outside UK: 5.9%, white: 96%, black: 0.7%, Asian: 1.4%, mixed: 1.1%, other: 0.7%, Christian: 73.3%, Muslim: 0.9%. Education census statistics for Chelmsford consisted of full-time students between 16- 74: 20.2%, No qualifications for ages between 16–74: 22.2%. Housing census statistics for Chelmsford consisted of owner occupied housing: 76.5%, social housing: 14.9% (Council: 11.3%, Housing Association 3.6%), privately rented: 6.3%, homes without central heating and/or private bathroom: 5.8%. 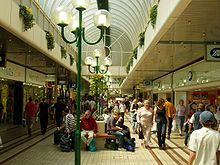 High Chelmer Shopping Centre prior to the 2009 refurbishment. Originally an agricultural and market town, Chelmsford has been an important centre for industry since the 19th century. Following the opening of the Chelmer and Blackwater Navigation in 1797, cheaper transportation and raw materials made milling and malting the main industries until the 1850s, when increasing prosperity created a local market for agricultural machinery. Foundries and engineering works followed including Fell Christy at his Factory (In later years known as Christy Norris Ltd) on the corner of Kings Road and Broomfield Road opened 1858, closed 1985, Coleman and Moreton, Thomas Clarkson (Steam Omnibus manufacturer and Founder of the Eastern National Bus Company) and Eddington and Stevenson (makers of traction engines). The Company Christy Norris still survives, trading as Christy Turner Ltd based in Ipswich. A residential street close to the old Factory was named "Fell Christy" in his honour. As well as the headquarters of Essex Police, Essex County and Chelmsford City Councils, the modern city is home to a range of national and international companies including M&G Group, e2v Technologies and ebm-papst UK Ltd. The continuing importance of Chelmsford as an employment centre is demonstrated by the fact that the number of "in" commuters (mostly from other parts of Essex) almost exactly balances the number of workers commuting into London. Chelmsford is largely a commercial city which employs around 80,000 people. There are three medium-sized shopping centres, Bond Street, High Chelmer and The Meadows. Chelmsford has six retail parks, Riverside, Chelmer Village, Clocktower Retail Park, The Army & Navy, Moulsham Lodge Retail Park and the smaller Homelands Retail Park housing a Flagship B&Q Store, Wyvale Garden Centre (part of the Garden centre Group) and Pets Corner. The High Street is full of independent and chain stores. As well as the leading High Street names, there is also a wide variety of specialist retailers, especially in Baddow Road and Moulsham Street which are located at the end of the pedestrianised High Street. On 29 September 2016 a new retail development opened anchored by John Lewis. On 6 January 2005, Chelmsford was granted Fairtrade Town status. Sizeable businesses are now based in the Chelmsford Business Park at Boreham housing companies such as the Anderson Group and Global Marine Systems. The city also has a low unemployment rate (1.6% in 2002) and a well-educated workforce, with 9% holding a degree or above (in 2002; British average: 7.1%). Chelmsford has a vibrant nightlife scene with many nightclubs, pubs, wine bars and restaurants in the city centre area, particularly in Duke Street, Moulsham Street, the city centre end of Baddow Road and the bottom section of Springfield Road. Its central Essex location and good public transport links make the city ideal for revellers, commuters and tourists to visit from surrounding areas. 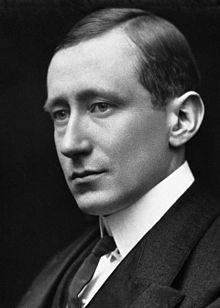 In 1899, Guglielmo Marconi opened the world's first "wireless" factory under the name 'The Marconi Wireless Telegraph & Signal Company' in Hall Street, employing around 50 people. The company was later called the Marconi Wireless Telegraph Company Ltd. For this reason Chelmsford is credited as the "birthplace of radio", and this phrase can be seen on administrative signs on major roads entering the city, although this statement is disputed. Marconi soon outgrew its Hall Street premises, and in June 1912 the company moved to the brand new purpose-built 70,000-square-foot (6,500 m2) New Street Works. 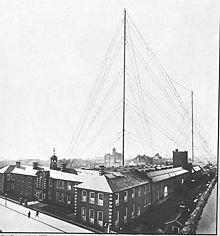 On 15 June 1920 the factory was the location of the first official publicised sound broadcast in the United Kingdom, featuring Dame Nellie Melba using two 450 feet (140 m) radio broadcasting masts. In 1922, the world's first regular wireless broadcasts for entertainment began from the Marconi laboratories at Writtle near Chelmsford – Call sign '2MT' in what was little more than a wooden hut. In 1999, Marconi's defence division, including the Chelmsford facilities, was purchased by British Aerospace to form BAE Systems. Two sites remain under BAE control; the Great Baddow site which is now BAE's Advanced Technology Centre and its Integrated Systems Technologies business at Glebe Road. The military and secure communications division of Marconi was merged into Selex Communications was based at the New Street factory however they vacated the site in April 2008 with the remaining operations moved to nearby Basildon. This brought to an end of more than 100 years of the Marconi name in Chelmsford. The New Street factory was scheduled to be redeveloped with work planned to start during 2010, however this fell through after the new site owners Ashwell Property Group entered administration in December 2009. The New Street factory remained empty, derelict and vandalised for several years much to the dismay of Marconi Veterans and Chelmsfordians. The site was finally sold for redevelopment to Bellway Homes in the summer of 2012 with demolition of the majority of the site including the iconic Marconi House and Building 720 in April/May 2013. Only the Grade II listed water tower, The 1912 front building façade, the New Street cottages and the power house will remain. Chelmsford became home to the United Kingdom's first electrical engineering works established by Rookes Evelyn Bell Crompton. 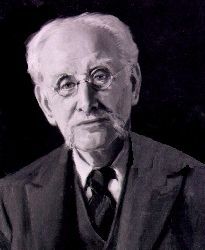 Crompton as he was better known was a leading authority of electrical engineering and was a pioneer of electric street lighting and electric traction motors within the United Kingdom. Crompton installed electric street lights around the town centre to celebrate the incorporation of the Borough of Chelmsford in 1888. Although this made Chelmsford one of the earliest towns to receive electric street lighting, the Council later decided to have it removed because gas was cheaper and the Council owned the gasworks. Crompton supplied the traction motors for the first electric trains on Southend Pier. The company also manufactured electrical switchgear, alternators and generators for many power stations in the UK and worldwide. Crompton set up his original factory known as the 'Arc Works' in Queen Street in 1878. After a fire there in 1895, he built a huge new electrical engineering factory also called the 'Arc Works' in Writtle Road. The Firm was called Crompton and Co. and in 1927 became Crompton Parkinson after Colonel Crompton formed a business partnership with fellow British electrical engineer Frank Parkinson. During World War II, the factory was frequently targeted by the Luftwaffe. In 1969 Crompton Parkinson Ltd was downsized and operations moved elsewhere after a takeover by Hawker Siddeley and the site was taken over by the Marconi Company and became the base for the newly formed Marconi Radar Systems Ltd.
After years of decline, the Marconi factory finally closed in 1992 and the site was demolished a few years later apart from the frontage on Writtle Road. A housing development called 'The Village' now occupies the site with road names such as Rookes Crescent, Evelyn Place, Crompton Street and Parkinson Drive as tributes to the former occupant. Hoffmann Ball bearings was a major employer in Chelmsford in the late 19 and early 20th centuries. They produced ball bearings which were used for early transatlantic flight. The firm became Ransome Hoffmann and Pollard (R.H.P.) after Hoffman's amalgamation with Ransome & Marles and Pollard Ball and Roller Bearing Company in 1969. The R.H.P. brand, intellectual property rights and company assets were absorbed into the Japanese NSK Ltd. bearing company in early 1990 trading as NSK-RHP Ltd. at its UK base in Newark on Trent with the historic R.H.P. name finally disappearing in 2001. Most of the former Hoffman New Street factory was demolished during the summer of 1990 and the site is now occupied by the sprawling Rivermead Campus of the Anglia Ruskin University. The only connection to the company name in Chelmsford today is the RHP Bowls club located on part of the old Hoffmans Social Club site at Canterbury Way and Hoffmans Way at the corner of the old factory site at New Street and Rectory Lane. The Waterhouse Lane–based company began in the early 1940s as a part of the Marconi group, manufacturing magnetrons for defence radar systems. The company was first registered as a separate company in Chelmsford, Essex in 1947 under Serge Aisenstein. Its initial name was the Phoenix Dynamo Co Ltd, though it immediately changed its name to English Electric Valve Company Ltd. In 1959 Bob Coulson established Traveling-wave tube and Microwave tube sections and they were producing ceramic hydrogen thyratrons as well. By this time EEV was the largest hi-tech manufacturing company in the UK. A year later they won an EMMY award for outstanding contribution to Electronics Technology in developing the 4½" orthicon tube. In 1961 they acquired Associated Electrical Industries Valve business based in Lincoln. Sir Charles Oatley was a director of the company from 1966 to 1985. In 1962, EEV opened its first office in America in Buffalo, NY. In the 1970s EEV collaborated with QinetiQ in the development of the pyroelectric vidicon, the first thermal imaging detector. The company has received 13 Queen's Awards for Technology in its history, most recently in 2006 for low light imaging devices and in 2004 for thyratrons for cancer radiotherapy treatment. Also, in 1972, they opened an office in Paris, France and in 1977 they opened another office in NY but this time in Elmsford. Keith Attwood, e2v's CEO joined in 1999, as MD of EEV, after a short period as Marconi Applied technologies, the company was renamed to e2v technologies in 2002 as part of a management buy out supported by 3i following the collapse of the Marconi group. Following further growth under 3i, in 2004 the company floated on the London Stock Exchange. In January 2007, the company celebrated 60 years in Chelmsford. The Britvic soft drink company began life as the British Vitamin Company in 1948. However, the origins of the company can be traced back to a chemist's shop in Tindal Street where flavoured waters were on sale as early as the mid-19th century. The company was acquired by Showerings of Shepton Mallet, and subsequently a division of Allied Breweries from 1968, The British Vitamin Company changed its name to Britvic in 1971. In 1986 it merged with Canada Dry Rawlings and acquired the R. White's Lemonade brand. It acquired Tango from Beechams in 1987 and since that year it has also owned the UK franchise for Pepsi and 7 Up. In 1995 it bought Robinson's from Reckitt & Colman. In December 2005 the Company underwent an initial public offering (IPO) allowing its main shareholders (InterContinental Hotels Group, Whitbread, Pernod Ricard) to realise their investments. In May 2007 the Company went on to buy the soft drinks and distribution businesses of Ireland's Cantrell & Cochrane (C&C) for £169.5m. On 14 November 2012 the Company agreed to merge with Scotland's A.G. Barr, producer of Scottish soft drinks Irn-Bru, Tizer and D'n'B, to create one of Europe's largest soft drinks companies. However the merger was put into serious doubt after the Office of Fair Trading referred the merger to the Competition Commission. The Britvic UK headquarters at Britvic House in Broomfield Road closed in March 2012. It relocated to Hemel Hempstead in order to facilitate better transport links for its staff. On 14 March 2014 the Britvic Westway factory closed for good thus ending the company's 150-year association with the city. The Eastern Counties Railway arrived in Chelmsford in 1842, although owing to the geography of the town, three viaducts had to be constructed, the longest of which is the 18 arch Central Park viaduct. The station was built at the end of the second viaduct with the third viaduct at the River Chelmer at Springfield. The present-day Chelmsford railway station dates from around 1885 and is in the city centre and around 14,000 commuters travel to London Liverpool Street daily on Greater Anglia services, making Chelmsford one of the busiest non-terminus stations outside London until 2010 when three early morning services were added starting at Chelmsford operating to London and three late evening services terminating at Chelmsford from London. Southbound services operate to London Liverpool Street and northbound services run to Colchester, Ipswich, Clacton-on-Sea, Harwich, Braintree and Norwich via the Great Eastern Main Line. Despite having platforms elevated on a viaduct, the station has full disabled access via a lift for each of the two platforms and as well as stair access. This dates from an extensive refurbishment of the station's ground-level facilities in the late 1980s by British Rail. Since 2011, a second station has been proposed for the new housing development in Beaulieu (Park), Boreham. A new bus terminal in Duke Street opened in March 2007 which replaced an ageing 1930s Bus station. It incorporates shops and apartments and has a covered roof for passengers. This is mainly used by First Essex which has many routes around the city and beyond including the X30 Southend to Stansted Airport Flyer. Other bus companies serving the area include Stephensons of Essex, Hedingham and Arriva Colchester. There are also a variety of school buses serving the city and surrounding areas. Outside of peak times many of these services are run under contract to Essex County Council. Arriva also operate a single service, the 59 route, to Harlow from Chelmsford, via Roxwell, The Rodings, Hatfield Heath and Old Harlow. The route is on the Hertfordshire Intalink network, allowing single-operator access to destinations within Hertfordshire, Bedfordshire, Buckinghamshire and Cambridgeshire, as well as select Greater London destinations such as Stanmore and Barnet. The route was previously operated by Tellings-Golden Miller. Essex County Council Highways & Transportation Department have considered the construction of a Bus Rapid Transit System to be built serving the Beaulieu Park/Springfield Area because of the increasing demand for Rapid Transit Plans in Ipswich, Colchester and Southend. Chelmsford has a park & ride service that is based at nearby Sandon, just off the A12 at Junction 18. It runs from 7 am to 7 pm, Monday to Saturday, with five bus stops around the city (one near High Chelmer for shopping), and charges £2.50 per adult and is free for old-age pensioners or people under the age of 16. An adult weekly ticket is £12.50 and Adult monthly £47.00. It has a capacity of 1,200 cars. Opened in March 2006, it has proved highly successful and is widely used. A second park & ride service known as the Chelmer Valley Park and Ride was opened on the A130/131 to the north of the city near the village of Little Waltham in April 2011. The A12 trunk road, running from London to Great Yarmouth originally built by the Romans to connect London and Colchester, used to pass through the city but is now diverted around the east. The £34.8m nine-mile (14 km) bypass opened in November 1986. It is a very important route, linking London and the M25 motorway with the docks at Harwich and Felixstowe, and the East Coast. Despite being notorious for frequent congestion, poor road surfaces and potholes, as well as accidents, many people move to Chelmsford for it being so well connected by not only rail services, but roads. The A414 trunk road, running from Hemel Hempstead to nearby Maldon, is a main road into the city, just off the A12, and also links the city to the M11 motorway at J7 near Harlow. The A130 provides an important link down to the A127 and A13, while the A131 passes through smaller towns and villages. The nearest motorway is the M25 London Orbital at J11 on the A12, 14 miles away. Chelmsford is around 25 to 30 minutes' drive from Stansted Airport (via A130/A120), and London Heathrow, London Gatwick, London City, Luton and Southend airports are all within reach. In the southwest of the city centre, the A138 meets the A414 at The Army and Navy roundabout which is notorious for its traffic congestion, even though the north–south road at this point is no longer part of the A12. Until 1986, when the Chelmsford bypass was opened, the roundabout was in an even worse state. Traffic lights were tried to improve matters in the early 2000s but that scheme was abandoned after a short while however some of the lights where recommissioned for early morning and evening part-time use in 2009. The recently built bus lane on the A1114 Great Baddow Bypass and priority to traffic using it has meant traffic queues approaching the roundabout can now be over 1 mi (1.6 km) long during peak periods. The junction is unusual for its flyover, in a similar manner to the Hogarth Roundabout in Chiswick, London. It is bi-directional, being open where traffic goes one way into city (westerly) until 2.30 pm each day and one way (easterly) out of the city after 2.30 pm. The flyover is now closed from 9 pm every night. A two-way flyover has been mooted ever since the original was built in 1978: it is very unlikely to happen – the local council has stated that the cost would be prohibitive. The roundabout is still called "The Army and Navy", even though the public house from which the junction got its name has been demolished. Construction of the £32 million replacement A138 'Chelmer Viaduct' road which connects Chelmer Village Way roundabout to the Army and Navy roundabout began in February 2015 and will replace the existing 1932 structure which will remain open during construction. However the old road and bridge will be demolished shortly after construction is completed. Since 2 September 2013 in order to save money and reduce carbon emissions, many streets lights in the Chelmsford district switched over to Essex County Council's part-night street lighting scheme. This involves most street lights being switched off between 1:00am and 5:00am (Tuesday to Sunday) with exceptions such as the city centre area, key road junctions, some pedestrian crossings and known accident sites. On Monday mornings the switch off is from midnight to 5:00am. 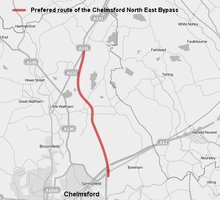 Proposals for a bypass of Chelmsford connecting the A12 interchange at Boreham (Junction 19) and the A131 were put forward for public consultation by Essex County Council in 2006, the preferred route was announced in March 2007. It comprises the creation of 7.9 km (4.9 mi) of two lane dual carriageway and junctions connecting to the A12 and A131, it will sever 10 footpaths/bridleways and involve almost entirely greenfield construction. The scheme was estimated to cost £138 million in March 2007 but was increased to an estimated range of £229 – £262 million in February 2008. The scheme still requires funding and planning permission with applications timetabled for 2009–2011, a public inquiry timetabled for 2012 and with an estimated construction start date of 2014–2016. The Chelmsford North Action Group (NAG) objects to this scheme, stating that Chelmsford was to "be engulfed by huge motorways connecting the Channel Ports, via a new Lower Thames Crossing, A130, on to Stansted, M11 and A14". A second new Park and Ride scheme on the A130 near Little Waltham in addition to that at Sandon began construction in March 2010 at a price of £7.9 million. There has been criticism of the park and ride as some worry it would be unable to provide a service to the nearby Broomfield Hospital from the new site. The Little Waltham Park and Ride opened in April 2011. A new second railway station for the city was announced in September 2009 and is due to be built near the Boreham Interchange. Completion for the project is likely to be in 2020. A major new development on the site of the old bus station was completed in 2007 which contains a new Bus Station, shops and luxury apartments. The lower level apartments of this development and the Bus Station area is known as "Marconi Plaza" while the upper level apartments are known as the "Kings Tower". The Bus Station and shops were opened in January 2007 while the rest of the development was ready in September 2007. A new housing development site near Beaulieu Park towards the north of the city is currently under construction. It will be an urban village containing around 3,500 homes. The Public House "The Army and Navy" from which the roundabout gets its name was demolished in March 2007. It was replaced by a Travelodge Hotel, a Frankie & Benny's Restaurant, a bed store and private apartments. Building work started at the site in October 2007 and the project was completed in December 2008. One of Chelmsford's two joint-tallest buildings, Melbourne Court (now renamed Parkside Court) in Melbourne Avenue, has received an £8,000,000 investment for extensive refurbishment and to create a new Neighbourhood Centre. This was completed early in 2009. Recently, plans were revealed for 'Waterside', a large development of shops, bars and restaurants on the banks of the River Chelmer on derelict land near the Essex Records Office at the end of Wharf Road. If this development goes ahead, High Bridge Road connecting Parkway and Springfield Road would be demolished along with the adjacent gasometers and a new central link road would be built. The former Anglia Ruskin University central campus off Park Road was demolished in January/February 2010 and has been redeveloped by social housing provider Genesis as a mixed use development of housing for social rent, alongside other new housing for private sale and several retail units, new squares, streets and plazas. The new development has been given the name ' City Park West'. High Chelmer Shopping Centre underwent a refit during 2008/2009 with new flooring, lighting with a new front entrance and logo re-brand. Further work is being carried out in the shopping centre; an old portion was demolished in Spring 2011. The work was completed in early 2012. In January 2011, John Lewis announced together with development partner Aquila House Holdings that it was to anchor a brand new 119,000-square-foot (11,100 m2) department store as part of a 300,000-square-foot (28,000 m2) retail development at Bond Street. There will also be 2 other large-format shops included in the development. The main anchor store will be complemented by a further 33 shops and 7 restaurants. In addition to this there will be a 275-space underground shoppers' car park. Construction work on the project started in early 2015. There are a small number of places of interest within Chelmsford, including the 18-arch Victorian railway viaduct that spans the River Can in Central Park. One of three railway viaducts in the city that carry the Great Eastern Main Line. The Viaduct was constructed during 1842 by the Eastern Counties Railway Company and opened for passenger traffic on 29 March 1843. Chelmsford Cathedral which is located directly behind The Shire Hall. Originally called St Mary's Church, it became a Cathedral when the Diocese of Chelmsford was created in 1914. It is officially the second smallest in England behind Derby Cathedral. Chelmsford's two tallest buildings are Parkside Court built in 1962 as Melbourne Court in Melbourne Avenue, sometimes locally known as Melbourne flats, and the new development completed in 2007, the 13-floor "Kings Tower" in Duke Street. They share the same height of 141.04 feet (42.99 m). 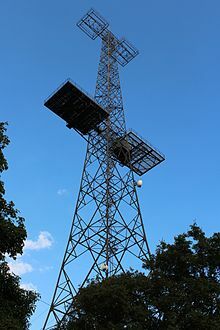 The tallest structure by far in the Chelmsford area is the former Chain Home radar tower in the urban village Great Baddow which rises to 360 ft (110 m). It originally stood at Canewdon but was reassembled in Chelmsford in 1959 and is the only Chain Home tower still in its original unmodified form in the UK. It is a highly visible landmark throughout the city and surrounding area. The Shire Hall is situated at the top of the High Street. Opened in July 1791 and built by local Architect and Essex County Surveyor John Johnson, it features a Portland Stone façade. One of the oldest and most prominent buildings in Chelmsford, it was built as a courthouse and there has been a court on the site since at least 1199. However this finally came to an end on 2 April 2012 with the opening of a new Magistrates Court a short distance away in New Street. Chelmsford Prison is a male prison and Young Offenders Institution, constructed in 1830. The 1979 film special of the TV series Porridge was filmed largely on location at Chelmsford Prison (while it was closed for repairs after a fire). The prison itself courted controversy for many years for its poor conditions, and was branded one of the worst gaols in the country by the Chief Inspector of Prisons in 2003. In 2011 the Chief Inspector returned to claim "Chelmsford was a transformed establishment" and awarded the prison an excellent report. Hylands House and Park just to the west of the city is a country house and parkland, saved from dereliction and purchased by the local council in 1966 after the death of the last private owner. Much damaged by fire and vandalism by the time of the sale, the house has now been completely restored by Chelmsford City Council. The house dates from 1730, and the park, 574 acres (2.32 km2), was landscaped by Humphry Repton. It is open to the public and used for a wide range of community events, including the annual music festival V Festival. It is also available for weddings and other private hires including conferences etc. The 21st World Scout Jamboree 2007 was held at Hylands Park from 27 July to 8 August 2007. Within the grounds which comprise woodland, rolling grassland and lakes is a large children's play area with adjoining car parking. Chelmsford Museum in Oaklands Park, off Moulsham Street, is a local history and industrial heritage museum which also incorporates the Essex Regiment Museum. A major £5 million extension and redevelopment scheme opened in January 2010 and the museum now includes exhibits and interactive displays focusing on Crompton, Marconi, and Hoffmann, as well as illustrating the development of the town and city from prehistory up to modern times. A second site at Sandford Mill – Chelmsford's former waterworks – displays further exhibits from Chelmsford's telecommunications, electrical engineering and rolling bearings industries. From over 600,000 years ago, during the Pleistocene ice age, until the Anglian Stage around 478,000 to 424,000 years ago, the early River Thames flowed through the area where Chelmsford now stands, from Harlow to Colchester, before crossing what is now the North Sea to become a tributary of the Rhine. Consequently, gravel deposits are frequently found in the area and current and former gravel pits in the district are common. Chelmsford has two rivers, the River Can and the River Chelmer. Although often confused to be the same river in the city centre, they are quite separate until they join together towards the east of the city to form the Chelmer and Blackwater Navigation which heads out towards Maldon before flowing into tidal waters at the Blackwater Estuary. In the other direction, the Chelmer comes from the north from its source near Thaxted while the Can comes from the West from Writtle where it separates from the River Wid. Up to the 1960s, these rivers were extremely prone to flooding the city centre area including two disastrous floods in August 1888 (known locally as 'The Great Flood') and in September 1958 (which also badly affected nearby Wickford) causing widespread damage. Flood prevention schemes in the 1960s on both rivers have largely prevented any further incidents here although the natural floodplains to the north and east such as The 'Baddow Meads' and The 'Chelmer Valley' continue to see flooding on a regular basis especially after prolonged heavy rainfall. As with most of the UK, Chelmsford has a maritime climate type, being to the southeast of England, the city enjoys a warmer climate than most of the United Kingdom and experiences the warmest summers in Britain; It is also one of the drier areas in the country. The nearest met office weather station is Writtle, about 1-mile (1.6 km) west of the city centre. Temperatures often reach 30.0 °C (86.0 °F) in the summer, this figure was last achieved on 27 July 2018 when 34.0c was recorded, this followed four preceding days with temperatures over 30.0c, on an average of 19.2 days the temperature will achieve a value of 25.1 °C (77.2 °F) or above. The hottest day on record was on Sunday 10 August 2003 when 35.7 °C (96.3 °F) was recorded. Before that, 35.2 °C (95.4 °F) was recorded in August 1990. On average, however, the hottest day should rise to 30.6 °C (87.1 °F). Rainfall averages 591.8 mm a year, with daily totals of over 1 mm falling on 108.1 days of the year. Thunderstorms mostly occur during July and August; however, they can occur anytime of the year. All averages refer to the 30-year observation period 1981–2010. Chelmsford was struck by an F1/T2 tornado on 23 November 1981, as part of the record-breaking nationwide tornado outbreak on that day, causing some damage in the city centre. John Dee, noted Elizabethan philosopher, magician and scientist and also responsible for the introduction to the first English translation of Euclid, was educated at the Chantry School (later re-founded as the Grammar School) in the sixteenth century. Chelmsford is also home to part of the Anglia Ruskin University (formerly called Anglia Polytechnic) and to the grammar schools of Chelmsford County High School and King Edward VI Grammar School, founded in 1551 by charter of King Edward VI on the site of an earlier educational foundation (although evidence suggests it could have been around as early as 1292). A Catholic Secondary School in the area is St John Payne Catholic Comprehensive School. New Hall School, founded in 1642, is a private, Catholic boarding school which caters to pupils from the age of 3 right through to sixth form. The New Hall building, previously named Palace of Beaulieu, has a great history including that of Henry VIII. Chelmsford College is the main provider of further education in the city. Established in the early 1960s, the college occupies three sites in the city. The main site on Moulsham Street dates from the 1960s and the Princes Road site is a late 1980s building. There are around 2,200 full-time and 2,100 part-time students enrolled on a wide range of academic, vocational and occupational programmes. The College is rated as "GOOD" by OFSTED and holds the prestigious Investors in People (IiP) Champion status and is also an IiP Gold award holder. St Peter's College, the former Rainsford High School, which closed in August 2011. Chelmsford also has a local opt-out of Heart FM. Heart Essex (previously Essex FM up to June 2009) has been on air since 12 September 1981 and has been owned by Global Radio since 2007. It moved to studios in Glebe Road in late 2004, having previously been based in Southend-on-Sea. In May 2009, the station was rebranded to The Heart of Essex, Essex FM. In June 2009, the popular Essex FM née Essex Radio name brand was dropped after 28 years. 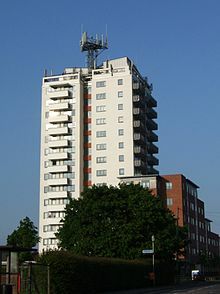 BBC Essex has been on air since 5 November 1986 and its studios are based in New London Road. There is a local Award-winning, Hospital Radio Station based out of Broomfield Hospital, known as Hospital Radio Chelmsford, the station has been running since 1964 and is supported by volunteers. The station broadcasts 24 hours for patients at the hospital but can also be listened to online and via the app. Since 2014, local community station CCR (Chelmsford Community Radio) has broadcast to the city via the internet. In 2015 the station won an FM community licence and launched in early 2017 on 104.4FM. 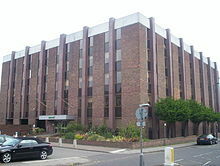 Until their closure in the mid-2000s Anglia Television/ITV Anglia had offices located in Chelmsford city centre. Chelmsford is served by London and East Anglia regional variations of the BBC and ITV1. Publications based in Chelmsford include the Essex Chronicle, which was founded as the Chelmsford Chronicle in 1764. The weekly Essex Chronicle newspaper is the longest in continuous publication in the country. Until the closure of the printing plant in 2002, the paper was also printed in the town. It is now printed on presses by the Northcliffe Media Group which now owns the paper. Chelmsford Weekly News is a free local paper delivered to every home. Another popular publication is the free "Edge" magazine, a primarily volunteer effort aimed at older Chelmsfordians. The Face of Chelmsford is a monthly magazine delivered to 12,500 homes in Chelmsford that has now become a digital publication updated daily. City Life is a newspaper produced by Chelmsford City Council that is distributed throughout the area. Chelmsford Cathedral is the second smallest cathedral in England after Derby Cathedral. It was built in the 15th and early 16th centuries, when it was the parish church of the prosperous medieval town. The Diocese of Chelmsford was established in 1914 from part of the Diocese of St Albans. It covers all of Essex and much of East London. Chelmsford is also situated in the Roman Catholic Diocese of Brentwood and the two dioceses are now uniquely (at least within England) conterminous. With the coming of the Reformation the Catholic community of Chelmsford was subjected to the anti-Catholic laws and Chelmsford was the site of the death of a Catholic martyr, Saint John Payne. In the 19th century, native Catholics resurfaced and immigrants helped to build up the Catholic community. There are now three Catholic churches within Chelmsford along with a Norbertine canonry situated on New London Road; St. Philip's Priory and one of the largest Catholic private boarding schools in the country, New Hall School. Other denominations are also represented, the Baptists, Jehovah's Witnesses, Seventh-day Adventist Church, The Church of Jesus Christ of Latter-day Saints and the United Reformed Church all have places of worship within the city. For the local Muslim community, the majority of which are Bengali and Pakistani, the Main Jamia Masjid mosque is located on Moulsham Street at the junction with Parkway. Essex County Cricket Club is one of the 18 first-class county clubs which make up the English domestic cricket structure, representing the county of Essex. The club is based at the County Ground in New Writtle Street close to the city centre. Chelmsford City Football Club play in the National League South. The Club's home ground is at the Chelmsford Sport & Athletics Centre, Melbourne Park where they share with Chelmsford Athletic Club. Chelmsford is one of the largest settlements in England without a Football League team. The city is also home to the Chelmsford Sunday League, of which there are five divisions consisting of teams from around the area. The former ground of the club the New Writtle Street Stadium also hosted greyhound racing. The Chelmsford Rugby Football Club was established in 1920 and for the last 40 years have been playing rugby at Coronation Park in Timpsons Lane. As of 2016 the club has over 300 members and fields up to five senior teams each week. The club as of 2016 plays in the London 1 North league, the sixth tier of English rugby. In addition to the senior teams, there are 150 youth members providing teams from under 6's to under 17's. Chelmsford Hockey Club is a Men's and Ladies' field hockey club based in the city. It fields eight men's teams and five ladies' teams every weekend. The Ladies' 1st XI compete in the English Hockey League Conference East as of July 2016. Chelmsford Swimming Club has been running for over 100 years and is located in the Riverside Ice and Leisure building in Chelmsford. Also based in the same building are the Chelmsford Chieftains, an Ice Hockey Team who play in the English National Ice Hockey League. The club promotes the use of junior players and local players from the Chelmsford and Essex area. Horse racing has been run at two separate venues using the name Chelmsford, neither actually in the city centre itself. The sport originally took place at Chelmsford Racecourse, at Galleywood, from the 18th century until its closure in 1935. A new racecourse was established at Great Leighs in 2008 and subsequently changed its name to Chelmsford City Racecourse. Since 2014 the city has held a marathon. Starting and ending in the city centre, the marathon takes in the city itself and the surrounding environs. The 2014 edition had over 1000 participants. The Chelmsford campus of Anglia Ruskin University also has many sports teams and facilities. 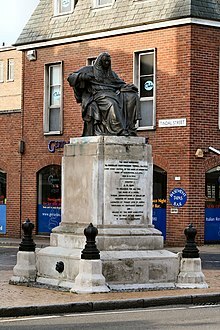 Statue of Sir Nicholas Conyngham Tindal, Tindal Square Chelmsford. Vicky Ward. Author, Investigative Journalist. Najma Akhtar (born 1962), jazz singer. Liam Chilvers (born 1981), professional footballer. Sarah Cracknell (born 1967), singer, Saint Etienne. Hazell Dean (born 1952), singer. James Gibson (born 1980), swimmer. Greg Halford (born 1984), professional footballer. Philemon Holland (born 1552), translator. Harry Judd (born 1985), drummer, McFly. George Clift King (born 1848), former Mayor of Calgary, Alberta, Canada. Anne Knight (born 1786), anti-slavery campaigner and pioneer of feminism. Malcolm O'Kelly (born 1974) Irish international rugby union player. Tom Payne (born 1982), Waterloo Road actor. Grayson Perry (born 1960) Turner prize-winning artist. Sarah Perry (born 1979) Writer. Richard Spare (born 1951) Artist. Nigel Spink (born 1958), professional footballer and European Cup winner as well as junior goalkeeper at Writtle Minors football club. Joseph Strutt (born 1742), engraver and antiquary. Sir Nicholas Conyngham Tindal (born 1776), lawyer, judge and Lord Chief Justice of the Common Pleas. James Harper (born 1980), professional footballer. Peter Collins (born 1948), professional footballer, Chelmsford City and Tottenham Hotspur. Guthrie Govan (born 1971), professional jazz/rock/fusion guitar player. Mike Edmonds (born 1944), notable dwarf actor. Alex Dowsett (born 1988), professional cyclist. Ronald Skirth (born 1897), World War I veteran who became a pacifist during the war and purposely miscalculated British guns. Joe Thomas (born 1983), actor. Tom Jenkinson (born 1975), a.k.a. Squarepusher, English electronic music artist. Andrew Jenkinson (born 1975), a.k.a. Ceephax Acid Crew, English electronic music artist. Sir Walter Mildmay (born 1525), Chancellor of the Exchequer of England under Queen Elizabeth I.
Tom McRae (born 1969), English singer-songwriter. John Alec Baker (born 1926), Writer and naturalist, best known for The Peregrine and the Hill of Summer. Penny Lancaster (born 1971), model and photographer. Married to rock singer Rod Stewart. Carole Lesley (born 1935), "Blonde bombshell" actress of the late 1950s and early 1960s. Gus Kenworthy (born 1991), freestyle skier. Reg Webb (born 1947), Musician. Nathan French (born 1990), Olympic volleyball player. ^ a b "2011 Census - Built-up areas". ONS. Retrieved 11 August 2013. ^ "Chelmsford". Collins Dictionary. n.d. Retrieved 23 September 2014. ^ "ONS – 2011 Census, Key Statistics for Local Authorities in England and Wales". ^ "Census 2011: Key Statistics Chelmsford" (PDF). Chelmsford City Council. Retrieved 17 March 2015. ^ "The Queen Gives Chelmsford City Status". Archived from the original on 29 October 2013. ^ "Chelmsford, Perth and St Asaph gain city status to mark the Diamond Jubilee". The official website of The Queen's Diamond Jubilee. Archived from the original on 30 October 2013. Retrieved 11 May 2012. ^ "Written Ministerial Statement - Diamond Jubilee Civic Honours Competition" (PDF). Cabinet Office. 14 March 2012. Retrieved 11 May 2012. ^ Geoffrey le Baker's: Chronicon Galfridi le Baker de Swynebroke Archived 31 August 2016 at the Wayback Machine, ed. Edward Maunde Thompson (Oxford, 1889). ^ King Robert the Bruce By A. F. Murison Archived 24 June 2016 at the Wayback Machine. ^ Scottish Kings 1005–1625, by Sir Archibald H Dunbar, Bt., Edinburgh, 1899, p. 127 Archived 31 August 2016 at the Wayback Machine, where Robert the Bruce's birthplace is given "at Writtle, near Chelmsford in Essex, on the 11th July 1274". Baker, cited above, is also mentioned with other authorities. ^ "Pamela Christine HOWSE, Civilian. Killed in Chelmsford". Chelmsfordwarmemorial.co.uk. Archived from the original on 3 June 2013. Retrieved 21 April 2012. ^ "Former Marconi site, New Street". ^ Essex County Council – Contact us Archived 22 September 2010 at the Wayback Machine. Retrieved 24 December 2007. ^ Chelmford City Council – Contact Us Archived 2 May 2016 at the Wayback Machine. Retrieved 24 December 2007. ^ "Headquarters". Essex.police.uk. Retrieved 21 April 2012. ^ Vision of Britain – Chelmsford hundred Archived 11 February 2009 at the Wayback Machine (historic map Archived 11 February 2009 at the Wayback Machine). Retrieved 24 December 2007. ^ a b Vision of Britain – Chelmsford MB Archived 11 February 2009 at the Wayback Machine (historic map Archived 11 February 2009 at the Wayback Machine). Retrieved 24 December 2007. ^ Fairtrade Foundation – "Archived copy". Archived from the original on 30 June 2007. Retrieved 28 June 2007. CS1 maint: Archived copy as title (link). Retrieved 18 February 2008. ^ Chelmsford Borough Council – Key Statistics About Chelmsford Archived 5 June 2012 at the Wayback Machine. Retrieved 24 December 2007. ^ "Tesla – Master of Lightning: Who Invented Radio?". PBS. Retrieved 17 September 2010. ^ "Chelmsford: Marconi moving after a century (From Chelmsford Weekly News)". Chelmsfordweeklynews.co.uk. Retrieved 21 April 2012. ^ "Legal action to save Marconi site (From Chelmsford Weekly News)". Chelmsfordweeklynews.co.uk. 12 June 2010. Retrieved 21 April 2012. ^ "The 90th anniversary of Dame Nellie's broadcast should have been a landmark event to be proud of. | This is Essex". Thisistotalessex.co.uk. 17 June 2010. Archived from the original on 5 May 2013. Retrieved 21 April 2012. ^ "Chelmsford: Former Marconi site, New Street". chelmsford.gov.uk. ^ Simons, R. & Sutherland, J., Forty Years of Marconi Radar from 1946 to 1986 Archived 4 March 2016 at the Wayback Machine, GEC Review, (1998). Retrieved 24 December 2007. ^ "History of Hoffmann Bearings - All Hoffmann Bearings or Replacement Hoffmann Bearings Available". www.hoffmannbearings.co.uk. Retrieved 21 April 2017. ^ a b c "About Us - History". Britvic UK PLC. Retrieved 29 March 2013. ^ Hood, Margaret (17 May 1996). "CLOSE-UP: CLIENT OF THE WEEK; Chief sets Robinsons enigma". www.campaignlive.co.uk. Retrieved 6 February 2019. ^ "UPDATE 1-Britvic merger with A.G. Barr under threat". Reuters. 13 February 2013. Retrieved 23 March 2013. ^ Ruddick, Graham (13 February 2013). "AG Barr and Britvic merger thwarted by the Office of Fair Trading". London: Telegraph. Retrieved 23 March 2013. ^ "Britvic's AG Barr merger referred to competition authorities". This is Money. 13 February 2013. Retrieved 23 March 2013. ^ "OFT refers soft drinks merger to Competition Commission - The Office of Fair Trading". Oft.gov.uk. 13 February 2013. Archived from the original on 8 March 2013. Retrieved 23 March 2013. ^ "Britvic plans to move UK headquarters out of Chelmsford". BBC News. 12 July 2011. ^ "Big business names that Chelmsford has lost... as Britvic joins the list". Essex Chronicle. Archived from the original on 16 March 2014. Retrieved 16 March 2014. ^ "Essex County Council". Essexcc.gov.uk. Retrieved 21 April 2012. ^ "A138 Chelmsford - Replacement of Chelmer Viaduct". highways.gov.uk. Archived from the original on 4 October 2016. Retrieved 19 January 2019. ^ "Highways Agency – A138 Chelmsford – Replacement of Chelmer Viaduct". Highways.gov.uk. Archived from the original on 6 April 2012. Retrieved 21 April 2012. ^ "Streetlights in Essex to be partially turned back on at night". Essex Chronicle. Archived from the original on 31 July 2015. Retrieved 4 August 2015. ^ "Part night lighting - Essex County Council". essexhighways.org. ^ a b "Cabinet Report Chelmsford NE Bypass". Essex County Council. Retrieved 18 November 2008. ^ "Chelmsford NE Bypass consultation January 2008 – Board 9" (PDF). Essex County Council. Retrieved 18 November 2008. ^ "When will the bypass happen?" (PDF). Essex County Council. Retrieved 18 November 2008. ^ "Chelmsford North Action Group (NAG)". ^ "Chelmer Valley Park and Ride". Essex County Council. Retrieved 14 August 2009. ^ Cllr Chris Rycroft (27 August 2008). "Give thought to park and ride to hospital". thisistotalessex.co.uk/. Archived from the original on 5 May 2013. Retrieved 5 October 2009. ^ aleys. "CHELMSFORD: New station set to arrive in 2015". Thisistotalessex.co.uk. Archived from the original on 12 September 2012. Retrieved 17 September 2010. ^ "Skyscrapernews.com Search results : United Kingdom > East Anglia > Chelmsford Borough Council". skyscrapernews.com. ^ " "Visit Chelmsford for a day out or a short break and discover the delights of the only Essex city". ^ "Shire Hall shuts as it loses its court role | This is Essex". Thisistotalessex.co.uk. 5 April 2012. Archived from the original on 13 September 2012. Retrieved 21 April 2012. ^ "Chelmsford Borough Council – New Chelmsford Museum draws in the crowds". Chelmsford.gov.uk. Retrieved 17 September 2010. ^ "Chelmsford City Council – Sandford Mill". Chelmsford.gov.uk. Retrieved 17 September 2010. ^ "1981-10 Days >25c". Retrieved 3 December 2012. ^ "1990 maximum". Retrieved 3 March 2011. ^ "1981-10 average warmest day". Retrieved 3 December 2012. ^ "1947 minimum". Retrieved 3 March 2011. ^ "1981 minimum". Retrieved 3 March 2011. ^ "2010 minimum". Retrieved 3 March 2011. ^ "Average coldest night". Retrieved 3 December 2012. ^ "European Severe Weather Database". www.eswd.eu. ^ "Climate Normals 1981–2010". Met Office. Retrieved 3 December 2012. ^ a b "Climate Normals 1971–2000". KNMI. Retrieved 3 March 2011. ^ "Home". New Hall School. Retrieved 30 August 2009. ^ pdent-jones. "EXCLUSIVE: St Peter's College in Chelmsford to shut". Thisistotalessex.co.uk. Archived from the original on 17 September 2012. Retrieved 17 September 2010. ^ "About us". The Bishops' C of E & R C Primary School. Archived from the original on 3 July 2015. Retrieved 31 July 2015. ^ "Chelmsford Radio". Chelmsford Radio. Archived from the original on 21 August 2010. Retrieved 17 September 2010. ^ "Cathedrals in the East of England: Chelmsford Cathedral". Retrieved 8 August 2012. ^ Chelmsfod Mosque. "Vacancy For Imam at Chelmsford Masjid". ^ "Metropolitan Districts". The Brisbane Courier. 13 November 1906. Retrieved 16 May 2015. The Chelmsford Swimming Club held a carnival in the Manly Baths. ^ Hawkins, Ted. "Galloping Galleywood". bbc.co.uk. Retrieved 2 March 2015. ^ "Racing back at 'Great Leighs'". racehorseowners.net. Archived from the original on 2 April 2015. Retrieved 2 March 2015. ^ "Chelmsford marathon 2015 will start from Shire Hall". Archived from the original on 30 July 2015. Retrieved 21 February 2016. ^ Mitchell, Michael (2018-03-09). "Sir Wilson Harris obituary". the Guardian. Retrieved 2018-03-10. ^ "Najma Biography: Contemporary Musicians". Enotes.com. Retrieved 30 August 2009. ^ Dewhurst, Tony. "Big Interview: Liam Chilvers – Lancashire Evening Post". Lep.co.uk. Retrieved 30 August 2009. ^ "Saint Etienne – news, pictures, reviews, biography, videos, best songs, discography, books, DVDs, concerts, gossip, pictures and tour dates". NME. UK. 17 July 2009. Retrieved 30 August 2009. ^ "British Swimming & The ASA : James Gibson MBE". Sportcentric.com. 6 February 1980. Archived from the original on 8 September 2008. Retrieved 30 August 2009. ^ "Halford happy to be Mr Versatile : Express & Star". Expressandstar.com. 15 July 2009. Retrieved 30 August 2009. ^ Considine, John (23 September 2004). "Holland, Philemon (1552–1637), translator". Oxford Dictionary of National Biography. doi:10.1093/ref:odnb/13535. Retrieved 6 February 2019. (Subscription required (help)). ^ "Girls line up to meet McFly in Leigh (From Echo)". Echo-news.co.uk. 27 October 2007. Retrieved 30 August 2009. ^ "City of Calgary Archives" (PDF). City of Calgary. Archived from the original (PDF) on 1 April 2011. Retrieved 6 October 2009. ^ "Key historical individuals". Understanding Slavery. Archived from the original on 1 July 2008. Retrieved 6 October 2009. ^ Thornley, Gerry (12 May 2010). "Walking tall after so many highs". The Irish Times. Retrieved 6 February 2019. ^ "Tim Mead (Counter-tenor) - Short Biography". bach-cantatas.com/. Retrieved 1 September 2016. ^ Rampton, James (25 April 2009). "On set – Best: His Mother's Son". London: Telegraph. Retrieved 30 August 2009. ^ "Entertainment | Profile: Turner winner Grayson Perry". BBC News. 8 December 2003. Retrieved 30 August 2009. ^ "Richard Spare - ArtPress Publishing". www.art-press.co.uk. ^ Swindells, Matt. "Spink's been there, done that". Wigan Today. Retrieved 30 August 2009. ^ "Joseph Strutt". Chestofbooks.com. Retrieved 17 September 2010. ^ "Death of Lord Chief Justice Tindal". The Chelmsford Chronicle (3942). 10 July 1846. p. 2. Retrieved 16 February 2019 – via British Newspaper Archive. ^ "Article: Harper snubs Ghana. | AccessMyLibrary – Promoting library advocacy". AccessMyLibrary. 27 April 2006. Retrieved 30 August 2009. ^ "Index entry—Births March 1898—Skirth John Ronald, Chelmsford 4a 571". FreeBMD. Office for National Statistics. Retrieved 22 September 2010. ^ "Walter Mildmay, MP (c.1521 - 1589) - Genealogy". geni_family_tree. ^ "Penny Lancaster: Biography". Retrieved 21 February 2016. ^ a b c "Chelmsford Town Twinning Association". Archived from the original on 17 May 2013. Retrieved 14 July 2013. ^ "Chelmsford Borough Council – Twin Towns". Chelmsford.gov.uk. Retrieved 17 September 2010. ^ "Chelmsford - China Daily". China Daily. Retrieved 9 May 2016. Wikimedia Commons has media related to Chelmsford. 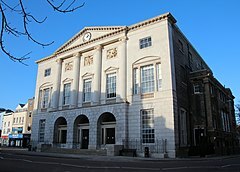 Wikivoyage has a travel guide for Chelmsford (England).